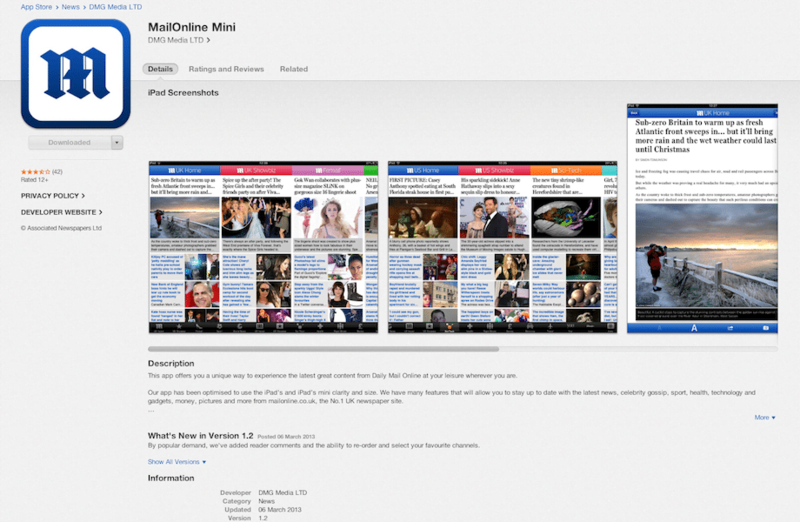 Can Factory developed The MailOnline iPad mini app app to better leverage the clarity and size of the iPad and iPad mini. Despite having only a 10-week project deadline the Can Factory team were able to deliver the app ahead of schedule, which allowed for the Mail Online team to introduce an extended feature set for launch. The iOS app integrates directly with a newly created live news feed API to provide customers with access to the largest English-language newspaper website worldwide with stories and photos from all of the MailOnline’s key channels, such as UK & World News, science & technology, sport, health, money, travel and more. The Can Factory team worked with the internal development team at MailOnline to create a new more customisable news feed API that would allow for changes to the application to be made without the need to re-submit it to the Apple App Store for approval. The new API had a number of configuration parameters in it that allowed for localisation, content filtering and even app configuration changes from the MailOnline back office systems. The app allows the user to select which channels to they want to automatically download, as well as re-order the channels so their favourites always appear first. The app also has a built in caching module that allows the user to open the app and sync all of the latest news content, before they get on the London Underground or go offline. In later releases the app was integrated with a further API to allow users to link their MailOnline accounts to the app, which in turn, allowed them to submit and view comments related to the news articles.